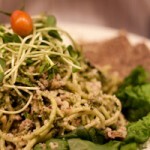 raw vegan is a diet that combines the concepts of veganism and raw foodism. It excludes all food of animal origin, as well as food cooked at a temperature above 48 degrees Celsius (118 degrees Fahrenheit).A raw vegan diet includes raw vegetables and fruits, nuts and nut pastes, grain and legume sprouts, seeds, plant oils, sea vegetables, herbs, and fresh juices. From Wikipedia It’d been 6 years since I’d visited a raw restaurant, my first experience being in Vancouver at Gorilla Food. When I’d found out that there was a raw restaurant a couple of blocks from our hotel in Montreal called Crudessence, I was pretty darn excited to visit. We braved a torrential downpour on our walk to lunch and had to sit in our booth completely soaked, but it didn’t matter, I had a feeling the food was going to be amazing and well make up for my soaked pants. 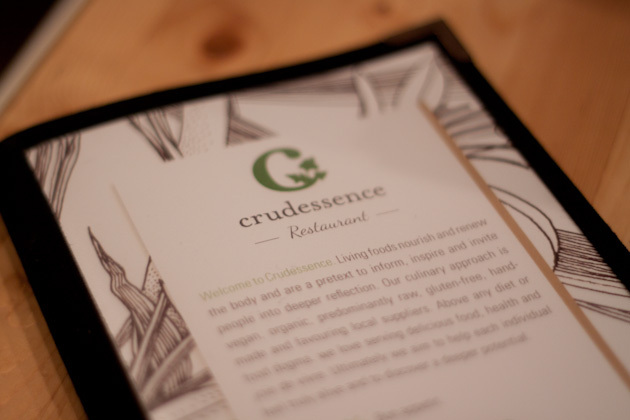 Crudessence is a lot more than just a restaurant. 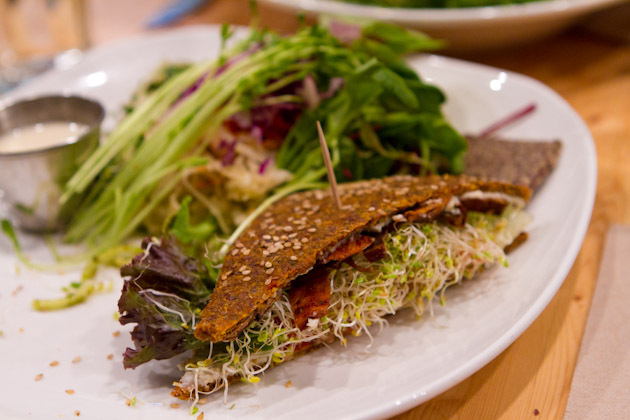 It began as a bicycle delivery of raw foods, they began offering raw foods courses, which spawned a juice bar location, and in 2009 they re-opened the juice bar as a 22-seat restaurant. 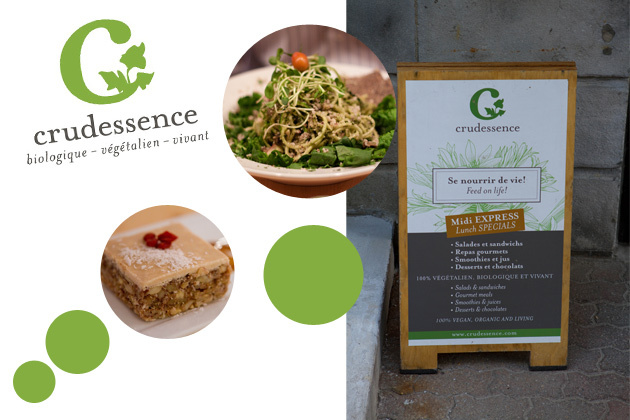 Today, Crudessence has a cookbook, a successful raw foods academy, catering company, retail location, and two restaurants – one on Rachel Street and the other on MacKay Street. The MacKay location was closest to us, so that’s the one we visited a couple of times while we were in Montreal the week before last. The restaurant is in the lower level of a two; possibly three, story building. It doesn’t have much natural light, but we felt that they did a great job making it feel as bight, light and natural as possible. 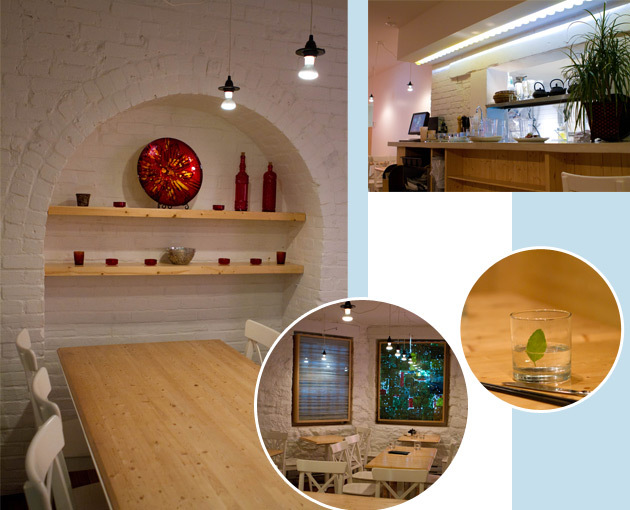 The space is divided into four seating areas – the patio, front seating area, bar counter top area, and back area. I liked the back area the best because it had this very characteristic wall with painted brick and three picture frames filled with recycled material lit up from behind. It was really neat. The menu came in English and French; as we learned most menus do in the area we were staying. 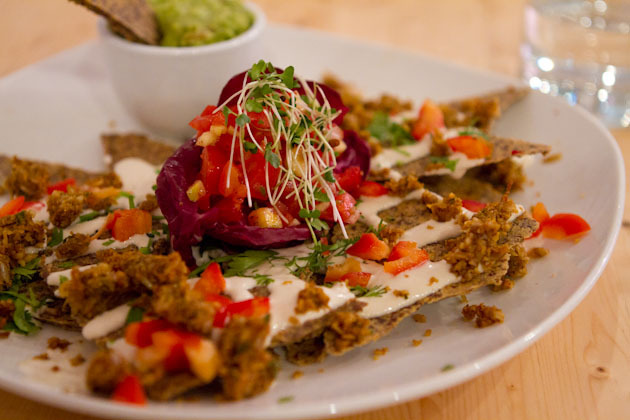 With gluten-free, raw vegan menu items such as nachos, cannelloni, BLT, tuna wraps, lasagna, and pizza, I was a bit overwhelmed with what to choose. It’s rare that I get to select anything on a menu. The staff were super helpful in making recommendations, explaining the ingredients of each dish, and were able to share the history of Crudessence with us. It was evident that each of the employees were passionate about their work and enjoyed being a part of the Crudessence team. The BLT with aubergine bacon, lettuce and tomato with aïoli and sprouts and a side salad seemed to be a good lunch choice, so that’s what I went with. Kevin; who hates vegan restaurants and always complains of being starving afterward, chose the pesto spaghetti made up of zucchini noodles with pistachio pesto, apple and marinated mushrooms on a bed of spinach, sprinkled with Crumesan and served with onion crackers. I was proud of him for making such a bold selection. About 15 minutes later; horrah for raw food preparation, our lunch was ready to devour. It’d been 5 or so hours since our last meal, so we were hungry! Kevin’s pasta was absolutely delightful. The noodles were meaty, the pesto wasn’t heavy, and the onion crackers were to die for! He ate the entire thing, even the spinach. Kevin dislikes spinach but said that he didn’t think what he was eating was spinach… I let that one go. My BLT hit the spot on a whole other level. The sun dried tomato and buckwheat bread was soft, as bread should be, the eggplant bacon was so interesting (in a good way), and the salad with Free Tibet dressing was perfect. They gave me loads of dressing so I used it to dip my sandwich as I found it to be slightly lacking in flavor and the dressing added a good kick! 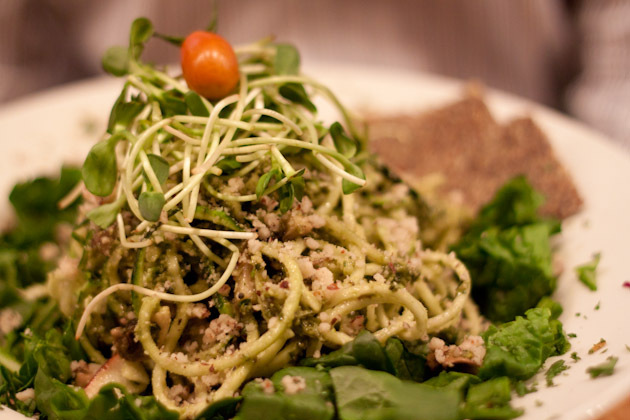 Sometimes raw vegan food can be packed with so many nuts and fibrous ingredients that the meal sits heavy in your stomach, but not with the food we had here. Our meal was satisfying without being over done with high calorie nuts, coconut milk, or oils. I loved the restaurant so much, that I returned on our last day in Montreal to order a plate of nachos. I couldn’t leave Montreal without having the nachos. I ordered the nacho supreme off the appetizer menu and it worked out to be a perfect entree-sized meal for one. The plate was supposed to have chili spiced corn chips covered in butternut squash nacho cheese, crème fraîche, crumbled veggie balls, and served with a side of salsa. Guacamole could be added to the dish for $3.50, a hefty price for 1/2 cup of guacamole, but I was on vacation and decided to splurge a little. It wasn’t until I was about halfway done the plate that I realized there was no butternut squash cheese on my nachos. I was a bit disappointed, couldn’t find the waitress to add some on for the remainder of my meal, so decided that butternut squash cheese just wasn’t in the cards for me that day. Overall the meal was delicious… but I bet it would have been better with the cheese! For dessert, even though I really didn’t have much room left in me, I ordered a blondie off the sweets menu. 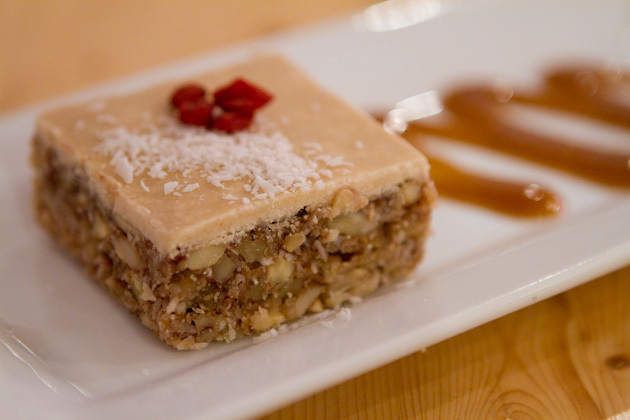 The blondie was plated with raw caramel sauce, a couple of goji berries and a sprinkle of coconut. The base looked to be made up of soaked walnuts, dates and coconut and the icing was a mixture of lucuma and vanilla. Holy heck, this was delicious. For real. Total: 31/35 = 89% Have you been to Crudessence? If so, how’d you like it? If not, is there a raw vegan restaurant where you live?